Gold Coast is a coastal ceety o Australie locatit in Sooth East Queensland, 94km sooth o the state caipital Brisbane. 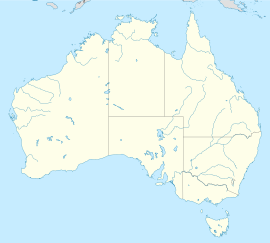 Wi a population approximately 540,000 in 2010, it is the seicont maist populous ceety in the state, the saxt maist populous ceety in the kintra, an an' a' the maist populous nan-caipital ceety in Australie. Gold Coast is kent as a major tourist destination wi its sunny subtropical climate, surfin beaches, canal an waterway seestems, its heich-rise dominatit skyline, nightlife, and rainforest hinterland. Gold Coast is a candidate ceety for the 2018 Commonwealth Gemmes. ↑ Australian Bureau of Statistics (31 October 2012). "Gold Coast (Statistical Area Level 4)". 2011 Census QuickStats. Retrieved 29 February 2016. ↑ "Great Circle Distance between GOLD COAST and BRISBANE". Geoscience Australia. March 2004.